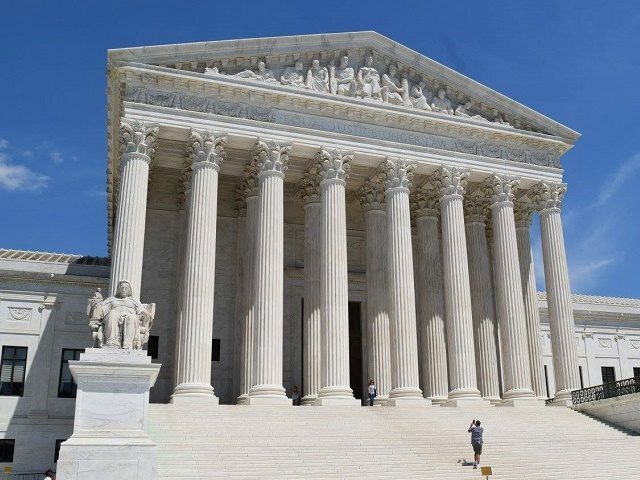 President Donald Trump’s travel ban is once again to largely go back into effect after the Supreme Court of the United States stayed two lower courts’ injunctions Monday. The orders come in response to filings by the Department of Justice Friday, asking the Supreme Court to stay the preliminary injunctions in the two main travel ban cases, Hawaii v. Trump in the Ninth Circuit and International Refugee Assistance Project v. Trump in the Fourth Circuit. These cases have been proceeding up and down the federal court system for months. The district courts, especially that of Barack Obama-appointed District of Hawaii Judge Derrick Watson, have repeatedly ruled that the bans must be blocked from going into effect or must, in the interim, be interpreted in such a way as to have little effect on the list of mostly Muslim majority countries from which travel is prohibited under the orders. The petitions in the two cases were made to Justice Anthony Kennedy and Chief Justice John Roberts respectively. Only Justices Ruth Bader Ginsburg and Sonia Sotomayor declined to sign on to the orders staying the Fourth and Ninth Circuits. “This a substantial victory for the safety and security of the American people,” Attorney General Jeff Sessions said in statement after the orders were announced. We are pleased to have defended this order and heartened that a clear majority Supreme Court has allowed the President’s lawful proclamation protecting our country’s national security to go into full effect. The Constitution gives the President the responsibility and power to protect this country from all threats foreign and domestic, and this order remains vital to accomplishing those goals. With the order, the third – permanent – version of the travel ban, promulgated in September after an interagency review of the dangers posed by the different countries included, will go back into effect while the case on the merits works its way through the court system. The Supreme Court had dismissed the earlier lawsuits based on the earlier, temporary versions of the ban because they had expired. The government, represented by Solicitor General Noel Francisco, asked the justices to re-instate the ban based in part on the findings of the review, which provided new security-based justifications for the inclusion of Chad, Iran, Libya, North Korea, Syria, Venezuela, and Yemen and, he argues, turns the likelihood of success against the plaintiffs.